CWB – USA is revisiting the same Balkan Route (#refugeeroad) that we traveled in 2017, deepening the relationships we formed a year ago. Veteran CWB performer Sabine Choucair takes us through the first few days of travel and an incredible coincidence. This man has perfect English and he used to be a chemist, working for a big factory in Slovenia. Then, he became a radio host for 10 years, but he lost his job when the radio station closed. He ended up on the street. 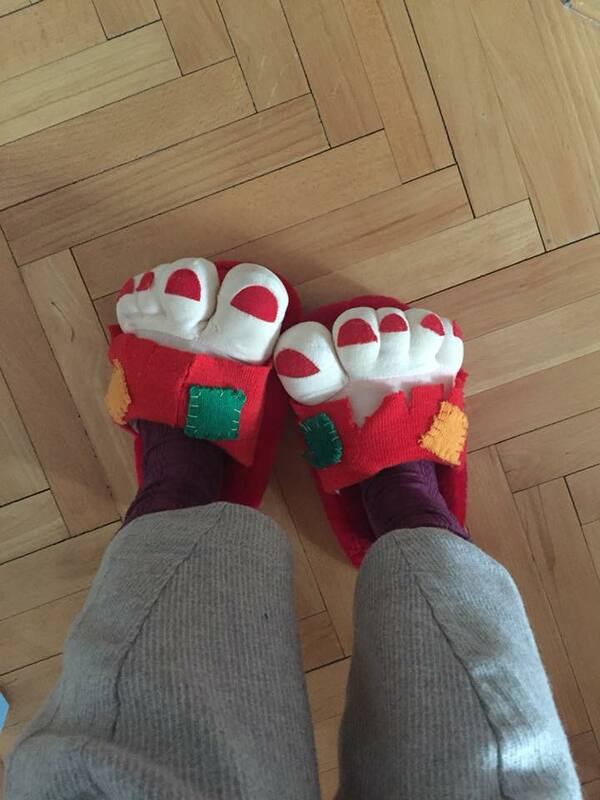 I decide to buy these slippers at the shop. I know they’ll continue to offer good things! Not shelter, except for my toes, but probably some laughs here and there when my clown decides to put them on. Hurray to the best five euros ever spent and to the amazing people out there. 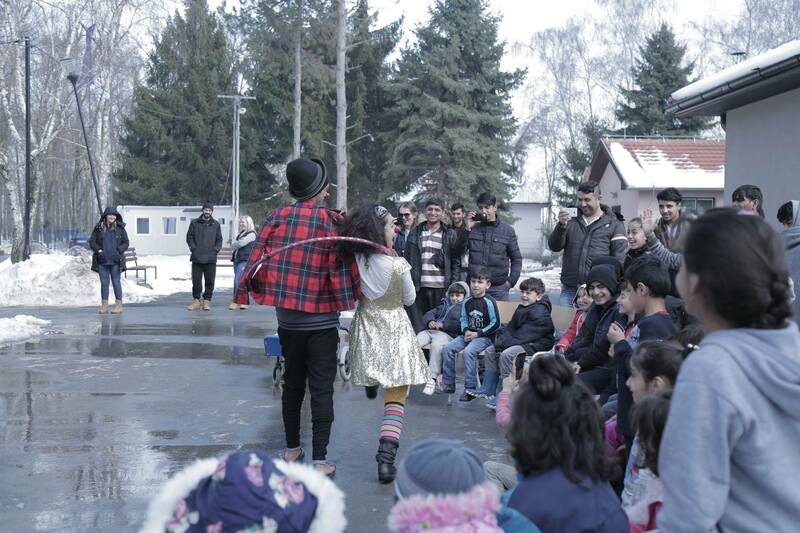 We perform for Pakistani refugees staying at the borders of Italy and Slovenia. They don’t know what will happen to them, whether they’ll be deported or able to stay. Some have been waiting for two years now and they still don’t know! In the afternoon we cross the border, just like that. 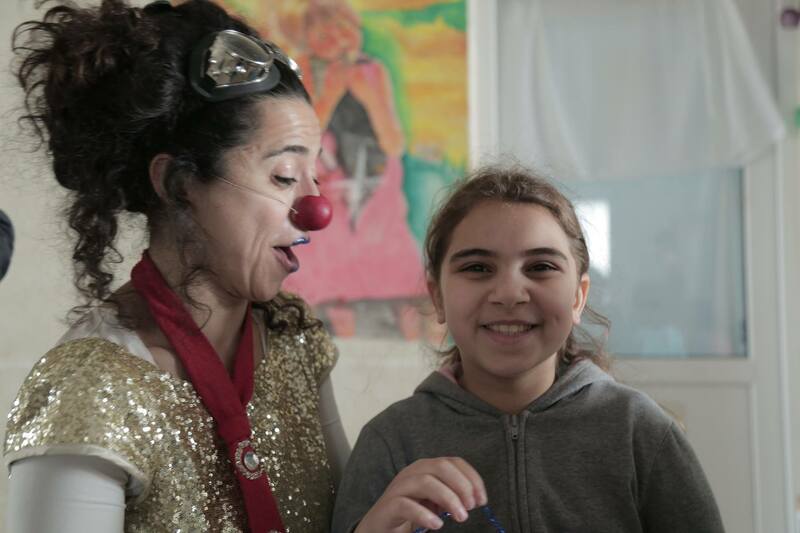 We go from Italy to Slovenia and perform in Ljubljana for Roma, Serbian, Bosnian and Iraqi refugees. We encounter border control on the train and I’m the only one asked to empty my bag so they can search it…and search me. They need to make sure I’m not a threat. As it happens, I’m reading Charlotte, a book by David Foenkinos that follows the life of a German Jewish painter growing up in Nazi Germany, living through the deportations, the atrocities, the inhumane behaviors; looking for refuge that ends in death; listening to Alois Brunner say that the people who deserve to die are sent by the devil and are garbage. And here we are, decades later, with the same thing happening to other populations, and in many different forms! There’s always someone who thinks that someone else is the garbage of humanity and deserves to die. Some of the previously oppressed nations or groups have become oppressors themselves, and new oppressors have appeared! Us humans, we’re mostly watching and nodding. On the train from Slovenia to Serbia, everything is white and the temperature is between -2 and 5 degrees Celsius! We’re on our way to clown for people who have been hiding in forests for more than two years now, and I’m so angry and sad. Long, empty roads, covered with white snow for as far as I can see! Today, we drive for about two hours to get to a camp in the middle of nowhere, Serbia. We’re welcomed by kids and adults who come running and laughing loudly when they see us. One little 11-year-old kid shouts, “Hey you! I know you. I saw you last year in Sid.” He had seen Clay Mazing and myself perform at the camp he lived in. It always warms my heart to hear such a thing. We play, blow bubbles, we laugh, and the following day we decide to go back and play some more with the kids and their families. Apparently, they’ve never had clowns passing by this camp near the Croatian border. And now, I’m on a mission! While I’m chatting with two teenage girls, one recounts how her best friend Aya moved with her parents to a different camp, three hours away. The two friends locked swings together with a beautiful ribbon as a token of their friendship. “She’s another friend who I’ve lost, and who I probably won’t see again,” says the girl. “That’s pretty much what happens to all my friendships.” We take a picture together and she asks me to go to the camp, perform and look for Aya. She asks me to show her the photo and tell her that her friend is in the middle of nowhere, but she misses her every day. Apparently, we’ve developed a good reputation in the Balkans. We received a last-minute permit to perform at the Subotica camp (where Aya lives). Mission accomplished! I didn’t even have to come up with an undercover clown costume. During the show, a girl volunteered to come up onstage and play with me. She looked at me and introduced herself. She said, “Hello, my name is Aya.” SERIOUSLY?! I was able to show her the photo of her friend. I think we should give clowns more missions in this world. Showing Aya a photo of her friend!